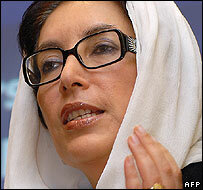 The BBC's M Ilyas Khan in Karachi examines the continuing controversy over the death of Benazir Bhutto on 27 December. In the immediate aftermath of the blast, police said that Ms Bhutto had safely escaped the attack. But later it became apparent that she had been taken to the Rawalpindi General Hospital's emergency section. A seven-member team of doctors which examined her told the health ministry that Ms Bhutto had open wounds on her left temporal region from which "brain matter was exuding". The report did not say what caused the wound, apparently because no autopsy had been performed on the body. A day later, an Interior Ministry spokesman, Brig Javed Iqbal Cheema, told the media that Ms Bhutto died of a skull fracture caused by a lever attached to the sun-roof of her bullet-proof vehicle. He said she must have hit her head against the lever when she ducked to escape the assassins' bullets. He denied that her body carried any gunshot wounds. This view has now been supported by a team of Scotland Yard investigators. In a report submitted by the British High Commission in Islamabad to the Interior Ministry on 8 February, the team states there is sufficient evidence to suggest that Ms Bhutto died due to a severe head injury, "sustained as a consequence of the bomb blast and due to head impact somewhere in the escape hatch of the vehicle". 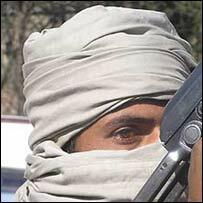 Ms Bhutto's Pakistan People's Party (PPP) has rejected both these versions, and has called for a wider inquiry by the UN to establish the identity and motives of the assassins. 4. Ms Bhutto was taken to Rawalpindi General Hospital, but was pronounced dead at 1816 local time. One point of contention between the PPP and the government has been the security provided to Ms Bhutto. 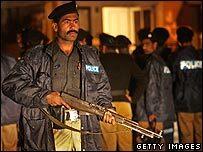 Given Ms Bhutto's status as a former prime minister and her popularity, the government would not like to be seen as having failed to provide adequate security to her, more so since the government itself had warned Ms Bhutto about threats to her life. But if the PPP's version is held to be true and the assassin indeed got so close to Ms Bhutto as to be able to hit her at almost point-blank range, then all sorts of questions are raised, ranging from lax security to complicity by elements within the government. JUST HOW LAX WAS THE SECURITY? At least two pieces of information that have come to light since the assassination suggest that security for Ms Bhutto was indeed lax. One is an e-mail she sent to her long time friend and lobbyist in the US, Mark Siegal, on 26 October. 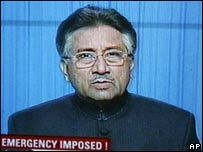 She wrote in the e-mail that she had been made to feel insecure by (President) Musharraf's "minions" and had not received the requested improvements to her security. She said she was being prevented from using private cars or vehicles equipped with tinted windows. She said that she had also not been provided with jammers to prevent remote controlled bombs or with police mobile outriders to cover her vehicle on all sides. The other material is amateur video footage that appears to show a man in sunglasses shooting at her from close quarters seconds before the blast. The findings of the Scotland Yard explosive expert that the bombing suspect was within one to two metres of the vehicle, "with no person or other obstruction between him and the vehicle", corroborates this information. Media reports suggest that the police and rangers guarding checkposts around the exit gate of Liaquat Bagh, where Ms Bhutto addressed the rally, left their posts before Ms Bhutto's vehicle drove out of the park. Critics of Ms Bhutto say she should not have exposed her head by standing up in the car. WHY DID MS BHUTTO'S HUSBAND REFUSE AN AUTOPSY? Ms Bhutto's husband, Asif Zardari, said that he was contacted by the Punjab home secretary who wanted permission to hold a post mortem examination, but that he refused the request. "We know how these autopsies are conducted and how the reports can be manipulated. We also know how she died," he told the media on Sunday. In conservative Pakistani society, women's bodies are rarely allowed by their relatives to be subjected to a post mortem examination. They are often not carried out on men either due to the belief that the process constitutes disrespect to the deceased. WHY WAS THE SCENE OF THE BLAST HOSED DOWN? The scene of the blast was washed with a high pressure hose of the fire brigade hours after the incident, apparently to clean the road. The interior ministry spokesman said the spot was washed after all the required evidence had been collected by the investigators. But the Scotland Yard investigators noted that the lack of both an autopsy and "an extended and detailed search of the crime scene" partly complicated the task of establishing exactly what happened. WHAT EVIDENCE IS THERE THAT THE ATTACK WAS ORDERED BY PAKISTANI TALEBAN? After the attack, the interior ministry provided the media with transcripts of a telephone conversation which it said was between a top Taleban commander in South Waziristan, Baitullah Mehsud, and an unnamed person. The two congratulate each other on a job well done, but Ms Bhutto's name is not mentioned in the brief conversation. The ministry spokesman says an audio tape of the Pashto-language conversation can also be provided to the media, adding that the government has Mr Mehsud's voice signature to prove that it is him talking. The transcripts were made public on the day an Italy-based news agency - Adnkronos International - quoted an al-Qaeda spokesman, Mustafa Abu al-Yezid, as claiming responsibility for the assassination. Shortly before Ms Bhutto's return to Pakistan in October, the Daily Times newspaper carried a statement from Mr Mehsud, saying he was determined to kill her because she was an American agent. A senator from South Waziristan who had reportedly passed the statement to the newspaper denied having done so two weeks later, when Ms Bhutto's convoy was bombed in Karachi on 18 October. Mr Mehsud's spokesman promptly denied the interior ministry's allegation, claiming that the audiotape of the alleged telephonic conversation was a fake. He has also demanded an investigation into the killing by "independent" agencies to identify the actual culprits.